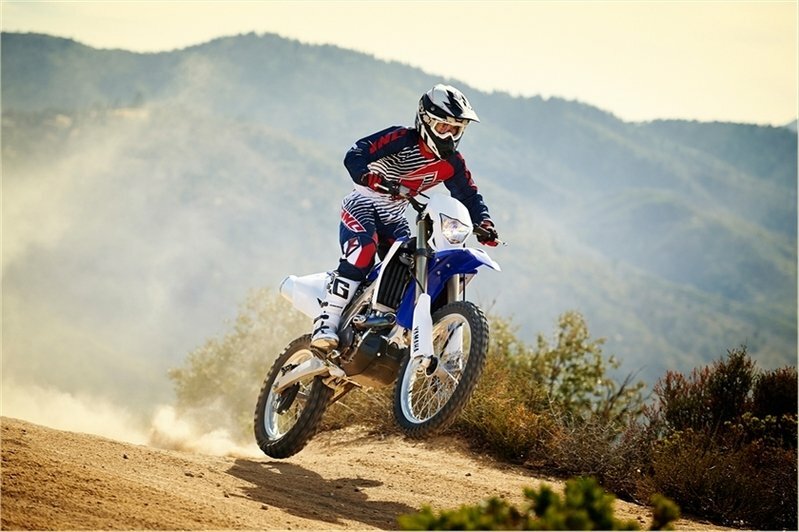 The latest WR450F from Yamaha comes with a wide range of advanced engine and chassis technology that’s designed to deliver winning performance on the track and all-round versatility on the trail. 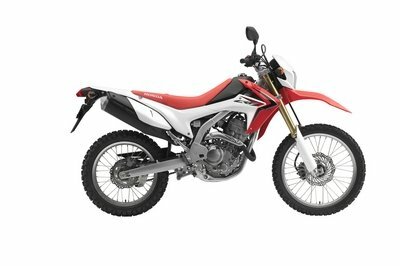 At the heart of this remarkably capable enduro bike is a gutsy and reliable 450cc 5-valve engine which is renowned for its strong and useable power. We’ve equipped this legendary powerplant with an advanced fuel injection system for even more stable and responsive performance. 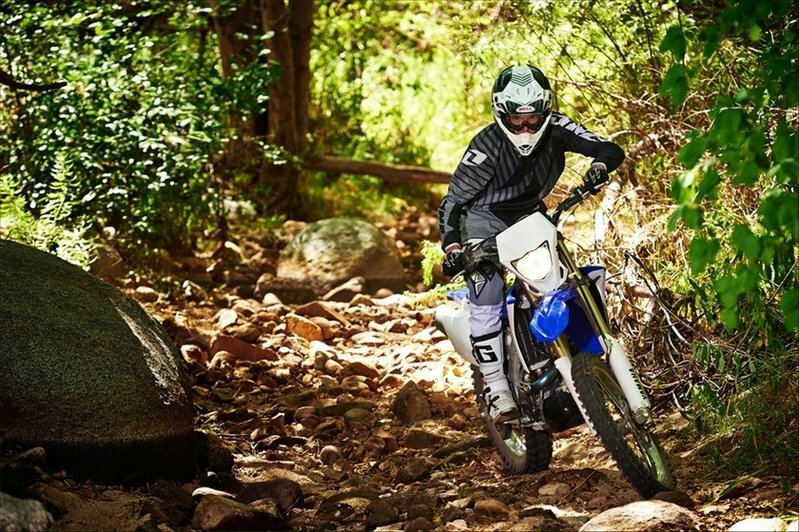 The chassis also gets a serious upgrade, and the latest WR450F now runs with a compact 250-class bilateral beam frame for quicker turning and enhanced agility. 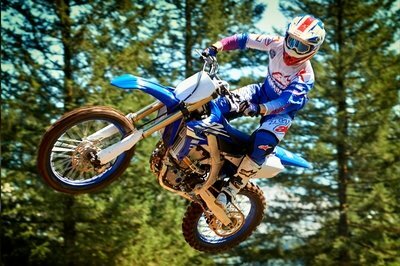 Continue reading for more information on the Yamaha WR450F. 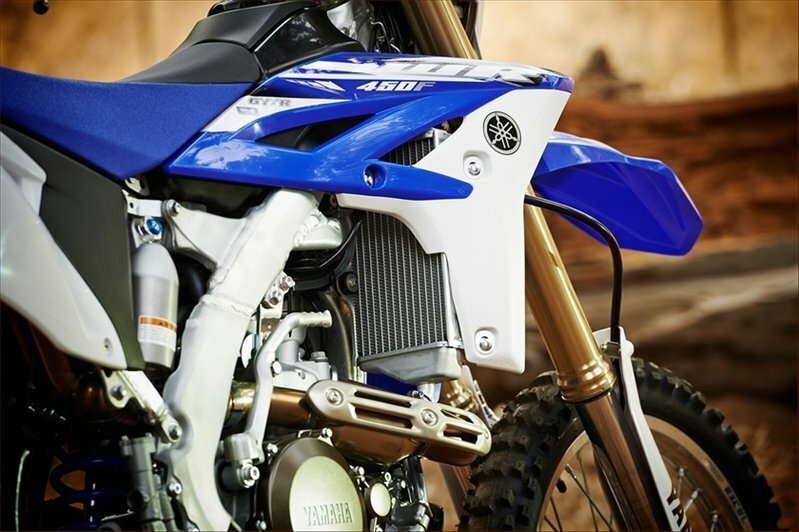 •	A YZ-bred advanced aluminum frame - carefully engineered from castings, forgings and extrusions—enhances handling while retaining legendary Yamaha feel and characteristics. •	Highly evolved five-titanium-valved engine starts with the push of a button. •	Highly functional digital enduro computer offers speedometer, clock, tripmeter, etc., in basic mode—or pace management functions such as timer, distance-compensating tripmeter, average speed, etc., when switched to race mode. 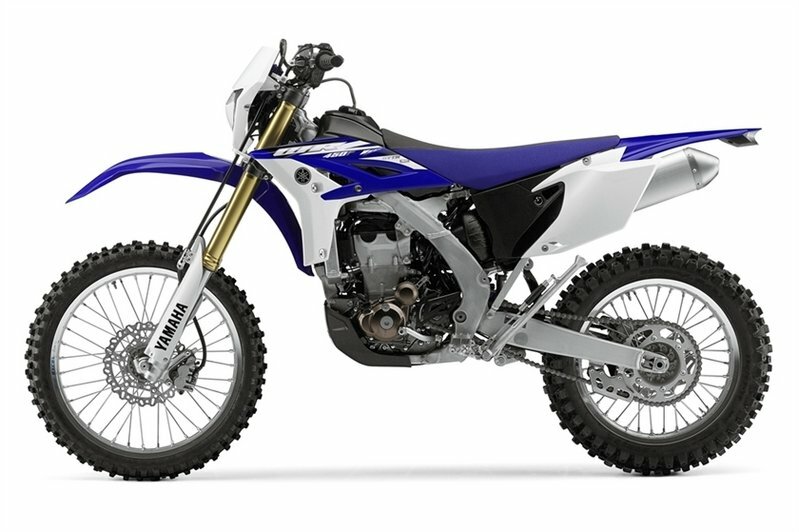 •	The WR450F is green sticker approved for California. •	449cc liquid-cooled DOHC four-stroke with five titanium valves delivers more broad power than ever, with high over-rev capacity and crisp, linear throttle response. •	Fuel injection system delivers quick throttle response and smooth power delivery at nearly all altitudes and temperatures. •	Dry-sump lubrication system carries the oil reservoir inside the engine cases, for excellent mass centralization and simplified plumbing. •	Digital TCI ignition system delivers precise spark and monitors engine speed to provide optimal timing for fast, strong response during hard acceleration. •	Large-capacity radiators with reinforcements provide maximum cooling efficiency with great strength. 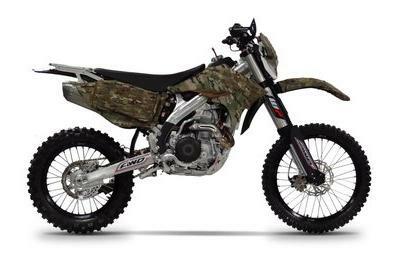 •	Wide-ratio five-speed transmission uses strengthened gears and YZ450F-spec multiplate clutch—good for quick-hitting power in the woods, as well as eye-opening top-end power. •	Lightweight exhaust system maximizes engine power. 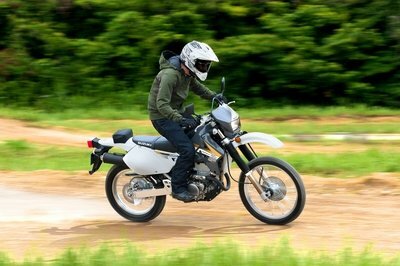 •	Aluminum muffler with USFS-approved spark arrestor looks trick and keeps things light. •	Works-style clutch lever features oversize barrel adjuster for easy, on-the-fly adjustability of lever/cable play. •	Electric start provides easy restarts. •	YZ250F-inspired frame makes for a compact size while optimizing mass centralization. With its extensively tested assembly of aluminum forgings and extrusions, the WR frame retains legendary Yamaha handling and response. 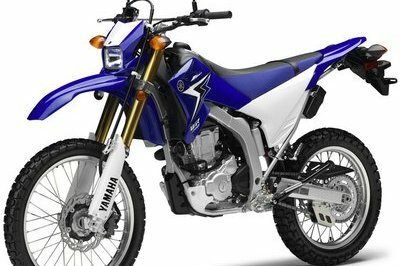 •	Compact YZ250F-based chassis provides a lightweight feeling with plush suspension performance for the most demanding rider. •	Removable aluminum rear subframe is constructed of square-section tube. •	Fully adjustable YZ-based KYB® air/oil-separate 48mm cartridge-type fork delivers precise, fade-free handling; fork protectors provide excellent tube protection. •	The KYB® shock provides 11.6 inches of travel with adjusters for high- and low-speed compression damping, rebound and spring preload—and features a large piggyback reservoir for excellent damping and fade resistance. •	Wave-style brake discs reduce unsprung weight and provide excellent performance. Front and rear calipers with aluminum pistons deliver strong stopping power with progressive feel. •	Lightweight 21-inch front and 18-inch rear Excel® rims provide exceptional durability and help reduce unsprung weight for optimal suspension performance. •	Repackable aluminum muffler shaves weight. •	Premium Dunlop® knobbies offer unbeatable, competition-spec traction and excellent wear. •	Cool YZ-derived bodywork and a thick seat look great and feel excellent on long rides. Tapered aluminum handlebar in forged triple clamp for light weight and great comfort. •	All this, including: tool-less access air box, Excel® rims, 18” rear wheel, tapered aluminum handlebars, wave-type brake rotors, electric start, on-the-fly clutch adjuster, O-ring chain and aluminum side stand. This machine is ready for tight trails, woods, or desert fun. •	Slim-design lightweight fuel tank holds 2.1 gallons. •	One-piece, high-strength, plastic skidplate shaves weight and offers great protection. •	Adjustable front brake lever. •	Ultra-wide footpegs for more comfort. •	Wheel collars make wheel removal quick and easy.